I'd been meaning to make bacon jam for months but just didn't get around to it. Then a bunch of friends from all over the world made a plan to meet and I thought, why not make bacon jam as a gift for them. As usual, I wanted to play around with the recipe and try something new. The basic recipe is awesome and is a superb canvas for adding new flavours - just like basic mayonnaise. I looked through the pantry cupboard and chanced upon my stock of Bhut Jolokia chillies that I'd bought on my trip to Assam earlier this year. Bacon jam with a spicy kick sounded like a good idea to me and so that's what I made. The basic recipe remains the same and I replaced the regular green chillies with a dried bhut jolokia chilli. This chilli is seriously potent so be careful how much you use. I'd say be conservative the first time and work your way up in subsequent trials. I didn't use whiskey in this batch. Instead I used port wine. Well that was also lying around neglected and this was a nice opportunity to use it up. The flavours worked very well indeed! The whiskey didn't get me very excited (hardly surprising because I don't really like the stuff!) and replacing it with some other flavour was at the top of my priorities. Red wine and port seemed to be good choices and they were. 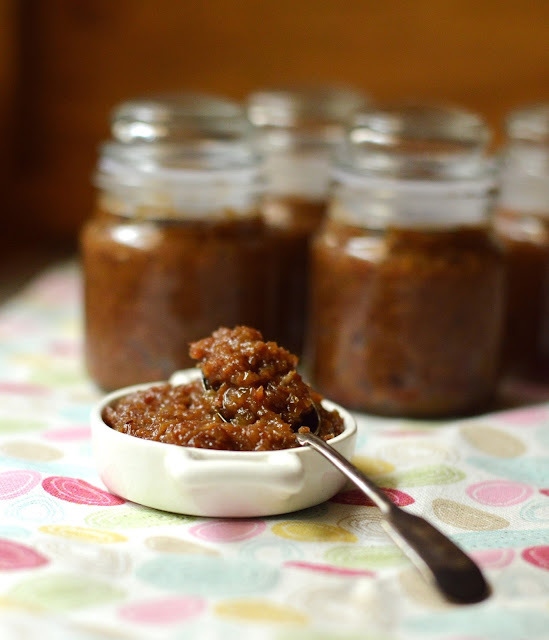 This is my basic bacon jam recipe. The element I consider integral to it, apart from the bacon and the onions, is the freshly brewed coffee. Don't skip the coffee. And don't ever use instant. I can't resist playing with recipes once I have mastered the basic version and this jam recipe is like a doorway to a land of wonder - the possibilities are just endless. Yet, some basic principles must be kept in mind so that there is a high chance of success once you've finished tweaking. It doesn't matter if the onions are not perfectly chopped, or that they're not very finely chopped. But cook them slowly and thoroughly. Use only as much of the bacon fat as required. Too much fat will mask the flavours of the other ingredients and you will get a stodgy jam. Use the best quality bacon you can afford. Use freshly brewed coffee, even if it's not a premium or fancy one. NO INSTANT. The experiment with the Bhut Jolokias was not limited to a change of chillies. I also did away with vinegar entirely, and added port and pomegranate molasses to the mix. Both liquids gave the jam a deeper, more rounded sweet and sour element compared to vinegar which has a sharp sourness. I'm tempted to slosh in a good slug of Balsamic in a batch...I'm sure it will work fabulously well. It's all very well concocting bacon jam recipes in the head but the toughest part, trust me, is when you're in the middle making a batch and you have a pile of perfect 'soft fried' bacon in front of you, and you have to do your best not to eat the lot! Look at this and you will understand... Sigh!